Lord Shiva stays at the top Mount Kailash which is a location both peaceful and serene. Any entrepreneur should always focus on a similar workplace (not always a hill). Such a workplace instills creativity and brings peace of mind. There are not many diversions or distractions during the work hours which helps in increasing productivity and faster setup / building of business. Devi Parvati had to do countless number of fasts and had to sacrifice a lot to finally make Lord Shiva agree for marriage. It’s not suggested that entrepreneurs should run away from marriages. This is required for a day to day working. There are many activities which we might take up for the first time when we are setting up a business. It’s easy to be swayed away by appraising words / events from surroundings which are good at their origin but might not be the fit for the company / person. Entrepreneurs should always do a due diligence before accepting any offer or following any strategy. When Lord Shiva agreed for marriage he didn’t demand any luxury or special preparation. Just drink and dine was offered from the Bride’s side and the Groom’s side enjoyed the feast. There was no extraordinary demand inspite of the the bride’s family being the ruler of a kingdom. For entrepreneurs, even if they are sitting on a pile of cash they should not unnecessarily make any investments which might just have to dumped in the future. It’s a definite urge to go for big shot PR activities, hiring at ultra high packages for premium brands and getting unlimited leisure activities for the team to inculcate the best workplace environment but all this should be avoided at all cost. There was an incident where Lord Shiva cut off his own son’s (Lord Ganesha’s) head. But he didn’t panic and got a replacement for it by a baby elephant’s head. Though it didn’t serve the complete purpose but it did let the functionalitis continue without any disruption. In the life of a startup, there are many situations where in we face unwanted / unexpected situations or some strategy which we might have planned failed unexpectedly. In these conditions, the entrepreneurs should always be on their feet and think of quicly implementable solutions for risk mitigation. It is not required to be the best solution but it should meet the bare minimum requirements. The 3rd eye of disruption. 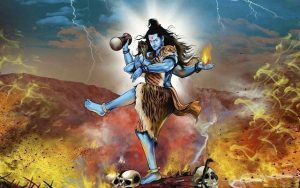 This is the most devouring skill used by Lord Shiva during intense battles. Whenever the going gets tough the tough gets going. Entrepreneurs should always have few skills up their sleeves for hard times. It can be an emergency fund or some external advisor or few prospective alliances / partners which can help beat the odds when the tide is completely against the ship. Lord Shiva is known as a brilliand classical dancer. Any hobby is good to have like playing a sport, musical instrument or travelling / trekking / fitness / painting. It always helps in regaining focus and getting refeshed after a hard day’s work or some tiring session. Many hobbies bring out the sportsmen spirit, improve collaborative skills, improve leadership qualities and keep both mentally / physically fit. During the time of “Samundra Manthan”, Lord Shiva gulped down the poison which came out. He offered this service himself to protect the entire humanity. Similar should be the mindset of the entrepreneur. In case of any emergency or dire situations they should step up from their regular role and take the front whether it be Sales, Marketing, Operations or any other requirement. The team should have confidence in their leader that they are always there to take care of them like a protector.